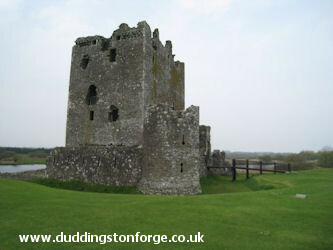 Duddingston Forge - Threave Castle Dumfries. Threave Castle in Dumfries and Galloway. Threave (or Thrieve) Castle is situated on an island in the River Dee, 2.5km (1.5miles) west of Castle Douglas, in Dumfries and Galloway,. It was the home of the 'Black' Douglas Earls of Douglas from the late 14th century until their fall in 1455. The Castle is now maintained by Historic Scotland. Duddingston Forge, the Edinburgh based blacksmith company, working for Historic Scotland created the hand forged wrought iron railings on the wooden bridge leading into the castle. The bridge being constructed by R.F Slight Joinery Ltd from Tranent. Forthweb © ( ) All rights reserved.